Iceland, where it’s you and your car against the elements and if you and your car aren’t leveled up enough, the elements will win. 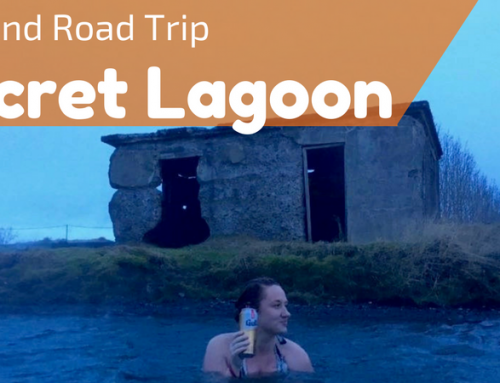 When we first rented our car in Iceland we were given a safety rundown with a warning that if we did not follow, serious repercussions would occur. I remember chuckling to myself as I was told my car door could get ripped apart or thrown off the road. A car door? Please. 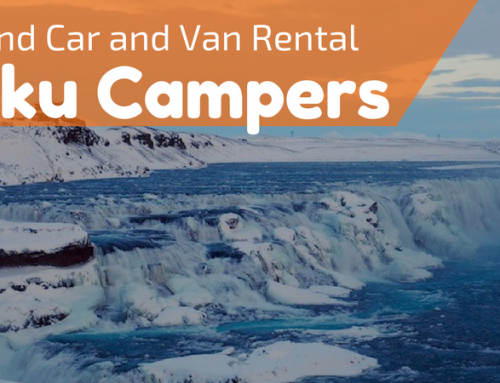 My mind soon changed, and that is why I am here to give you all the best tips and tricks to renting a car, driving safety – including winter driving in Iceland- and all the rules of the road. After our safety briefing, we were well on our way. As we ventured down a rough black sand beach to the DC plane crash. We parked. I cracked my window open and stuck my hand out. We were parked the wrong way, as told by our Iceland rental company. We reversed and positioned ourselves with the wind pushing against the door. My boyfriend carefully exited his side of the car then came over to help me. Staggering toward the wreckage I looked over and saw an unfortunate couple battling the same battle I just had, but their car was already severely damaged and parked in the wrong direction. The door was hanging off the hinges and would neither shut nor open. During our time in Iceland we several cars in the ditch, stuck in snow and sliding over ice and I pitied the drivers since they probably didn’t receive the proper training we received, or perhaps, they were just negligent. It is important to heed the rules of the road in Iceland and be prepared for the worst. Whether it’s summer or winter renting a 4×4 is the way to go. In the summer, many of the roads are for 4×4 and off-roading only. 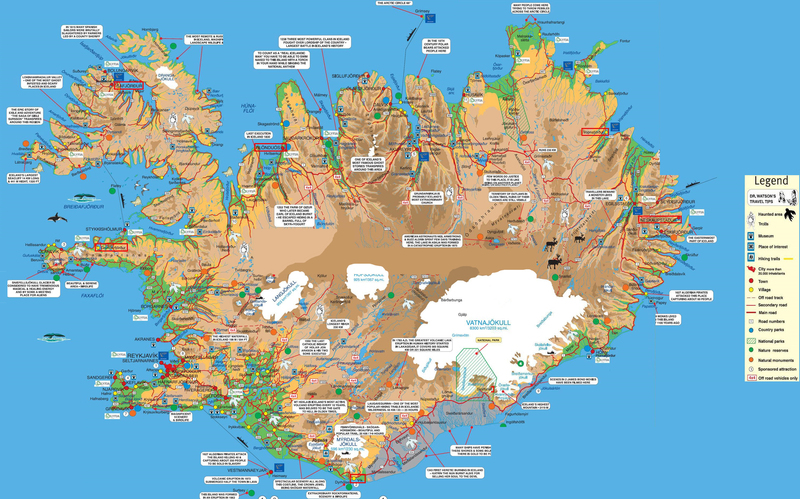 Most maps of Iceland list what roads are considered off-road. In the winter even the main roads, can be covered in inches of solid ice or snow. The extra strength helps you maintain control over the car and helps prevent you sliding off. It’s important to be a safe and cautious drive in the snow. Things to help prevent you from sliding off the road are, giving yourself a safe distance between you and the car in front of you, pump the breaks, never overcorrect your steering wheel, listen to all rules of the road and don’t drive during severe storms or weather. In the off chance you do go into the snowy banks the 4×4 is easiest to help you maneuver your way out. If you find your car stuck in a snow ditch in Iceland what should you do? First, don’t panic and attempt to speed out or spin your tires excessively! A. Check your exhaust pipe. If it’s covered in snow, clear it to prevent toxic chemicals from building up in your car. B. Clear the snow away from your tires. Use a shovel if you have one. If you don’t use your hands and stomp with your boots. Straighten your tires and rock the car back and forth carefully by shifting from drive to reverse. Make sure the path is flat and straight as possible. Break up any ice with any type of sharp tool in your car. The pieces provide traction. C. Lay traction. This could be dirt you can find from nearby, granola from breakfast, floor mats, a line of twigs or smaller rocks.. anything. D. Assess the easiest way out. You want to keep your tires straight, with that being said is it easier to go straight back or straight ahead? This will be determined by the angle of your car and side with the least amount of snow or debris blocking it. E. Rock and Gain Momentum. If you’re alone, slowly begin you rock your car. This time instead of going from drive to reverse utilize the gas peddle allowing your car to gain momentum as you rock. If the direction you want to go is forward, apply gas in drive, if backward, apply gas in reverse. If you have a buddy have them push from behind or forward for the extra push when needed. Wind is a serious concern when driving in Iceland. The wind can create gusts of 30 m/s or 120k/h which is crazy! When I said the door could get ripped off I meant it! Wind can also be hard to predict, often changing haphazardly. To prevent wind damage park your car as best you can with the wind pushing the car door closed, not open. Roll down the window and test the wind, re-position your car as needed. CAREFULLY open the door with a hand supporting from inside and the other hand supporting the outside. Make sure you’re strong enough to open the door and hold it from closing on your leg or flying open. Open it as little as you can while squeezing out. Don’t open both doors at the same time, or things will fly off the dashboard. We lost several gloves this way. This can be rather complicated and stressful as there are many additional options, such as sand damage, ash damage, and even sheep insurance! It’s advised to ALWAYS get a general protection and CDW insurance. Check with your credit card company, as many of them provide CDW if you rent a car and it is much cheaper. Do you need any of the extra stuff, like ash damage or sheep damage? If a volcano has a chance of erupting ash protection might be needed, otherwise, ash isn’t that common. Sand and rocks are common, especially during storms, but they rarely cause too much damage and most insurance companies only care about golf ball sized dents- check with them though. As a rule of thumb, stay on main roads during storms and or wait out the storm in a safe harbor to prevent any type of rock damage to your car. That being said, it’s up to you to determine the cost of the insurance vs the cost of any possible repair. For some, paying $5 extra dollars is worth the potential of paying out $10,000. Car thefts are very rare in Iceland and you most likely won’t need this insurance. The airport is about an hour away from Reykjavik and a shuttle bus is about 20 euros, make sure if you book with a company outside the airport they include an airport pickup, some companies offer free pickup, so it might be worth digging around for one that has a car there, or offers free pickup. Often times, you can find a better deal online than in person. 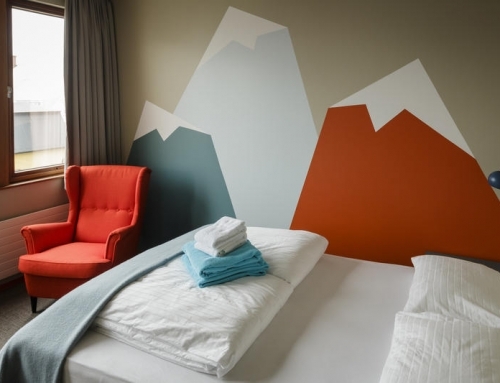 I would recommend booking online in advance if you find a good deal. Car rentals vary based on the type of car (4×4 vs 2 door… etc) and also vary based on time of year. If budgeting is important to you, the time of year can be an important decision. Peak season in Iceland is from the middle of June to end of August, with the slow season from the beginning of November to end of April. A mid-price season falls during all other dates. The cost difference for my 4×4 Dodge Durango camper went from 250 euro per day, in peak to 160 euro per day, in Winter. Keep in mind this was a camper, so this price included all my sleeping budget too. Smaller vehicles range from 35-150 euros per day based on the season. Speed limits may appear to be very slow for some. That is for your safety. Also, with a lack of police in the country, it may be tempting to speed but don’t. Hardly anyone does and often the roads will change from 2 lanes to one lane in seconds notice, black ice may be hidden or a storm can come up. Most off-roads are called F roads. These are the most difficult to travel and can often be closed. Make sure you check all roads before planning your trip and always have a plan B in case weather does not allow plan A. Most F roads open around June and close around September. It’s important to drive slow to avoid bottoming out. Avoid thick mud and only cross rivers at designated crossing areas. All F roads are closed in the winter. In the winter many other roads are also closed including some smaller roads to popular destinations. Check all driving conditions, here. This should be checked daily. Also check weather conditions, Heredaily. Pay attention to all signs and warnings and do not push your luck. Map your route with plan A and plan B for every day. Most car rental companies put a limit on the amount of km you can drive per day and it’s around 300km. No, you can not drive around the entire country in 5 days, unless you always want to be in the car. I know it seems do-able, but even in the Summer, it’s not. Google maps is becoming better with Iceland navigation, but it can struggle with the native language and misdirects you. Rent a GPS if you can, or pre-map out a google map route and save it. Always have a hand map on you in case something goes terribly wrong. Routes work best if you start in Reykjavik and work your way right toward Vik. These are easier roads and you can get a feel for your comfort level. Check out this Map! A. Gas prices equate to about $6-7 a gallon in Iceland. They are standardized and don’t change much throughout the country. B. Never use the fill-up option when getting gas, it holds a set amount of money on your card, usually more than you want to pay or have held. C. While several gas stations are open 24 hours, some only open at 4 AM while others open at 9 AM and close at 10 PM. My rule of thumb is to never leave a town with a gas station with less than half a tank of gas to be safe. The more limited hours and times are usually in the Winter months. D. Highlands vs. Lowlands. Weather in the Highlands can be very volatile with unmaintained roads. It’s the more risky route. Be prepared for snow, rain, wind and potholes, no matter the time of year. E. To save money most bridges are built as one-land roads with pull outs for longer bridges. Slow down and look for headlights coming toward you. F. Always carry one day supply of food, water and warm blankets in your car if going off-road. It also doesn’t hurt to let the rental company or a hotel front desk where you plan to head for the day. Don’t forget to share this, so you can be safe while driving or renting your next car for a road trip in Iceland! Thanks a ton for this information! We are going early June and I have noted your advice. Much appreciated! At least you won’t have all the snow to deal with in June! I want to go back in the summer with a 4×4 so I can get to all the awesome hidden hot springs we missed out in the winter. Let me know if you have any questions along the way. I am happy to help if I can! Hope you enjoy your trip. Thank you for all the super practical tips! 120k/h wind is absolutely insane and seriously scary! Great tips! If we ever make it to Iceland, I’ll let you know. Cheers! Great post – so informative and easy to read. I would love to drive around Iceland so I’ve added it to my bucket list! Really good tips. So many things which are obvious but I did not even think about. Wow, very well done. Very useful if we head out to Iceland. Thanks! I like passing by every gas station I see if I’m doing a long trip in any place I don’t know well cause you never know when you’ll run out of gas and where the next station is. Perfect tips. Thank you. Thanks for the practical tips. 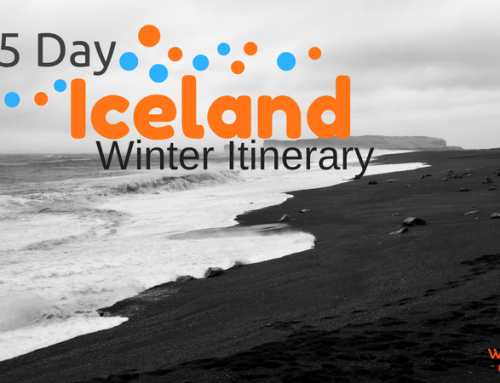 I’d never considered driving in Iceland, but It’s great info to share with my travel clients. What an experience. Great safety tips. Iceland is on my list of places to visit. Good to know about the driving concerns. Great post! Cheers for this post Susanna! Planning on visiting Iceland next year and debating a roadtrip. Nice to have this kind of background info! This is very useful and can be applied to some other countries and routes. Ah what a great article! 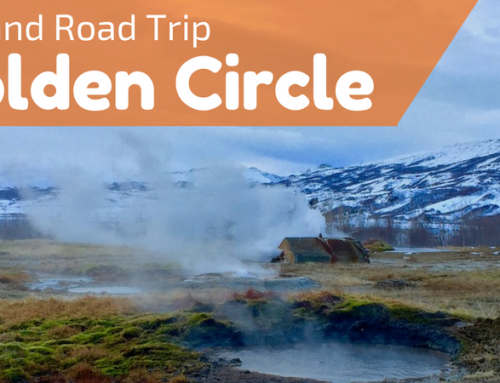 I don’t drive but I’ve always wanted to do a road trip in Iceland – I visited January last year and I’m going back for a few days in September, not sure if we will have time to drive around but if we do then I’ll show my parents this article. Thanks! Hello there! I was wondering where you rented your car from? I know I want to get a 4×4 but just wondering where you got those prices from? Prices do vary by season as well. So, the prices in the summer will be more, and in the fall and winter the cost decreases. Your post has such great information I have not seen in most other places. The tip about the wind and parking the car is so smart! I remember a time when the car door also clipped my leg really hard because of how hard the wind was. Hitting a sheep, huh? I saw a cute sheep on the side of the road was I drove by once. It looked my direction, waited for me and the car behind to pass, looked both ways then crossed when it was clear. Hahh I checked the rear view mirror to make sure it crossed okay. I’m so glad it helped you find the answers you were looking for! I’m glad the sheep was safe! 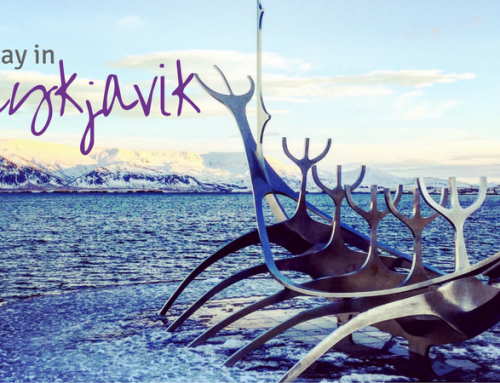 Have fun in Iceland and feel free to let me know if you have any questions!